LRWC has been extremely disturbed by the violent police crackdown on 29 November 2012 against peaceful villagers and monks demonstrating against expansion of the Lapadaung Taung Copper Mine. More than 50 monks and 40 villagers were injured in attacks by authorities with water cannons and incendiary devices, causing serious chemical burns and other severe injuries. In addition, on 29 November 2012, Yangon police arrested six leaders of a rally in support of anti-mine demonstrators, including Naw Ohn Hla, Wai Lu, Shan Ma and others. On 3 December, two other protest leaders, Ko Moe Thwe and Ko Aung Soe, were arrested, charged with inciting unrest and denied bail. 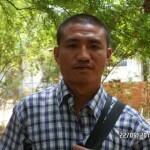 LRWC deplores the arrest and detention of former monk, Nyi Nyi Lwin (U Gambira) on 1 December 2012. U Gambira was one of several hundred political prisoners released 13 January 2012; he had been imprisoned for leading peaceful demonstrations of monks in 2007. He was reportedly brutally tortured and ill-treated during his imprisonment, resulting in serious deterioration of his physical and mental health. LRWC calls for the unconditional release and dropping of all charges against all peaceful demonstrators including Ko Moe Thwe and Ko Aung Soe, Naw Ohn Hla, Wai Lu, Shan Ma and others. LRWC also urges the immediate and unconditional release of U Gambira (photo at right).